Gennady Golovkin destructively stopped Marco Antonio Rubio with a crushing 2nd round knockout to retain his world middleweight titles in Carson, California. The StubHub center was absolutely rocking for the highly anticipated main event, and it sure didn't disappoint. Both fighters made a good start, and quite a few bombs were thrown in the first round. Golovkin rocked Rubio with a solid right hand but the Mexican still held his own and defended enough to stay in the fight. However, he wasn't in it for long. 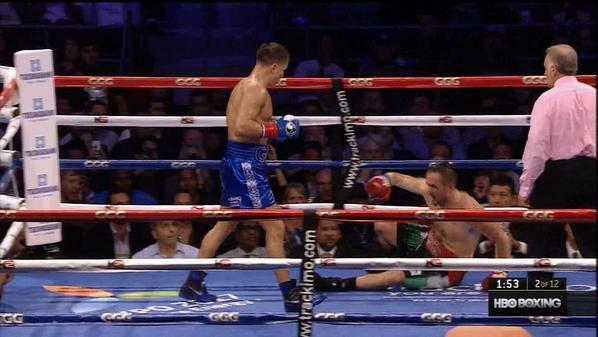 A blistering right uppercut softened Rubio and then "GGG" struck. He smashed the Mexican with a crunching left hand which was thrown from an unusual angle. It was still enough to drop Rubio and put him flat on the canvas. The Mexican wanted nothing more to do with Golovkin, and it was blatantly obvious. Absolutely ruthless from Golovkin, there is no stopping this monster. After the fight, he talked about a possible fight with Miguel Cotto, but if that isn't possible, Canelo could be next.